Can You Put Engagement Rings on Layaway? An engagement is a joyous occasion, but the cost of a ring can put a damper on your excitement. Although every retailer adheres to different policies, there are lots of stores offering layaway plans for jewelry, including engagement rings. Fees and the processes for plans where you pay over time vary from store to store. In a layaway plan the store typically holds onto your selected ring while you make regular payments toward the final cost. Once you pay off the ring, you take it home. Choose the ring you'd like to purchase. Prove you are at least 18 years old. There is typically no credit check required. Agree to the layaway terms and make your down payment, which can be up to 25 percent of the ring's price tag. Follow the outlined payment schedule. Pick up your ring when it is entirely paid off. While you won't pay interest with most layaway plans, you may pay fees specific to each retailer. Service fees range from $5-$10 and are the most common fee associated with these plans. If you're unable to complete your layaway plan for any reason, most stores take a cancellation fee or restocking fee then give the rest of your money back in cash or as store credit. The consequences of defaulting on a layaway plan are less drastic than if you default on credit card payments. 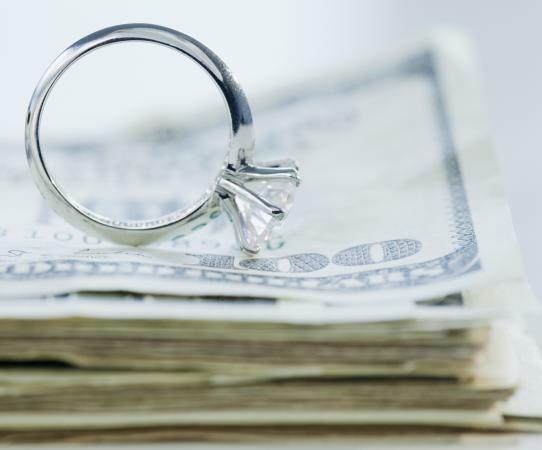 While you'll pay a little more for the ring on layaway thanks to the fees, it's a better alternative than incurring large interest payments or being unable to pay off a high credit card bill. If budget is a concern, an engagement ring layaway plan may be your best option. Many popular brick and mortar jewelry stores offer layaway plans as a service to customers. Policies may vary by location, so it is always best to ask a store manager for details. Layaway plans at Kay Jewelers are for in-store purchases only. Customers put 20 percent down then make regular monthly payments based on the purchase price of the ring. You can cancel the plan anytime for a full refund, including the down payment. Plans vary by store and ring. For more details on terms contact a local Kay store. Local Zales' stores offer a Ten for Ten Layaway Plan that is not available for online purchases. Customers put down 10 percent of the purchase price at the start. From there you pay ten equal monthly installments for the rest of the cost. Additional details are only available by contacting a local store. Helzberg's unique Price Lock Layaway program allows you to lock in the cost of your engagement ring at the time you sign up for the plan. This plan is only available in stores, not online, and requires a 10 percent down payment for the total amount of the sale. You choose any time period up to ten months to pay off your ring. You also decide your own monthly payment amounts. When it is paid in full you'll take the ring home. To make payments, you take each one to the store where your ring is being held. If you need to cancel for any reason, they give a full refund. If you miss a monthly payment, the store can cancel your layaway but they'll still give you a full refund. There are no fees for using this layaway plan. Jared's offers an in-store only plan for customers. This layaway plan requires a 20 percent down payment. 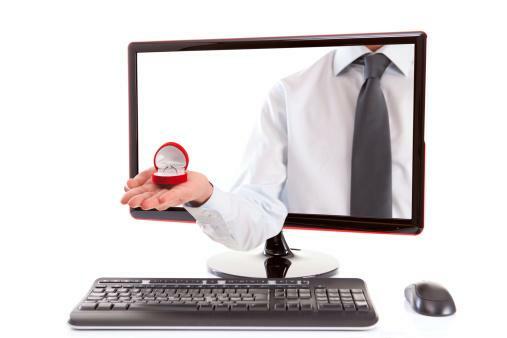 From there you make payments on a monthly basis determined by the cost of your ring. Since plans are specific to each store and ring, you'll need to contact your local Jared store for more details. All layaway plans feature a cancel anytime term where you receive a full refund of whatever you've paid up until the time of cancellation. Some jewelry stores operate online only, with no physical stores to shop in. Because these retailers are progressive by nature, they are more likely to offer varied payment options. This online retailer offers a No Fee Layaway Plan where you choose between weekly, bi-weekly, or monthly payment plans. At My Trio Rings you also have the option to make a down payment of 10, 25, or 50 percent. To start, you need to choose the ring online then checkout. During checkout, in the Billing Section, you select "Layaway Plan" and then set the terms before completing the transaction. This payment plan can be changed at any time during your layaway, but cannot exceed six months' duration. Your credit or debit card is charged automatically based on the terms you select. Once the ring is paid off, it ships a few days after the last payment is accepted. A cancellation by the customer results in a 25 percent cancellation fee, but you will get the rest of your money refunded. Online retailer 25karats.com offers a simple layaway plan on their American-made engagement rings. Start your plan with a 15 percent down payment, then make equal monthly payments for six months for rings under $2500 or ten months for rings over that price. Cancellations made within 30 days have no penalty, but a cancellation after the initial 30 days results in a 15 percent fee. After they receive your last payment, the ring ships to you. You need a Paypal account to use Wedding Ring Depot's layaway option. You pay a 6.5 percent nonrefundable processing fee then select a payment plan of up to six months. Monthly payments are distributed equally across the time period you select. Invoices are sent to your Paypal account and then you make the payments from there. Once you pay off the ring, it ships within 48 hours of the last payment. You can cancel your plan anytime for a full refund, minus the processing fee. Unlike other layaway plans Since 1910 only offers layaway for purchases over $1,000. After you make the 25 percent deposit, your plan will be set up with a maximum six-month timeframe to pay it off in full. You can use a debit card, credit card, Google account, or Paypal to checkout and make payments. Because these rings are custom made or made-to-order you cannot typically cancel a layaway plan, but the retailer will work with customers on an individual basis to see if there are alternative options. An engagement ring serves as a symbol of your love and your relationship that will last throughout your time together. 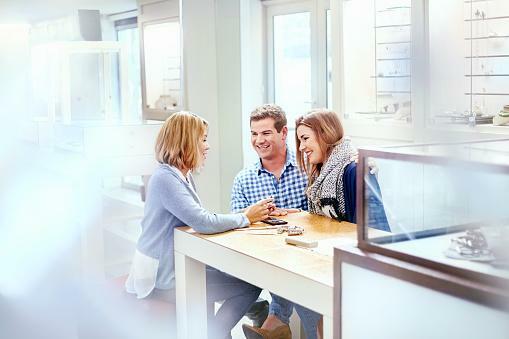 Options like a layaway plan offer everyone, regardless of income, the chance to buy the ring of their dreams.